Facts never lie. In a survey done for the academic year 2012, 96% of transition year students voted our course was the oustanding highlight of their year. 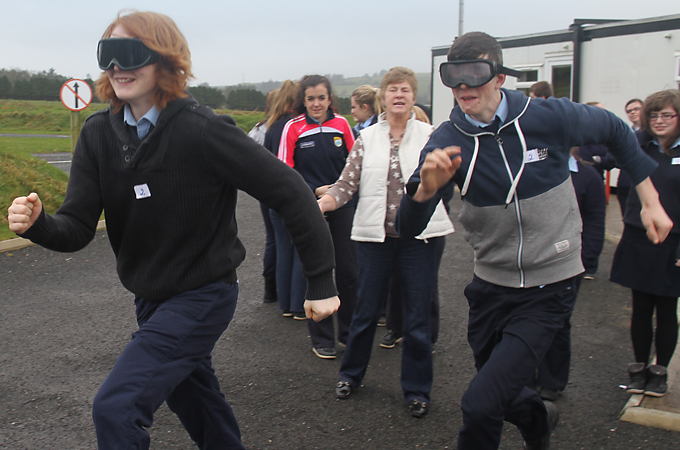 Life long driving skills and driving knowledge are acquired by both students and tansition year co-ordinators. Course Content – The course is wide ranging and incorporates the many driving skills needed to drive an automobile in a safe manner. 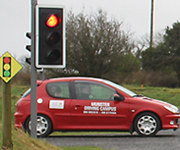 Each student will have a minimum of 20mins driving accompanied by a qualified driving instructor. 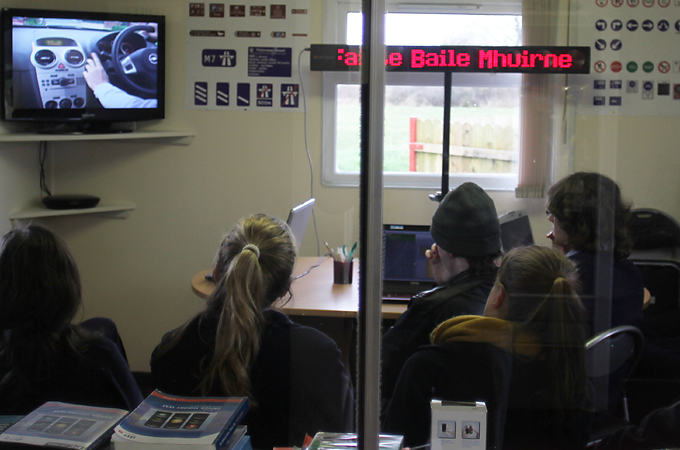 A crash course on engine maintenance will be experienced in the garage and essential preparation for the students theory test will be covered in the office. This course will be completed in 3.5 hours including a break for lunch. 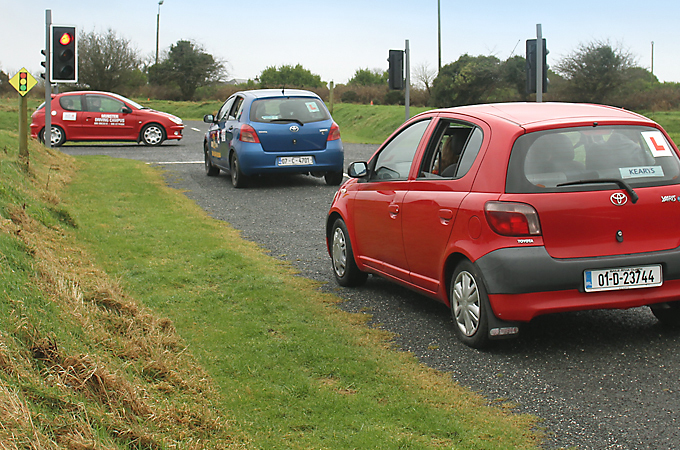 Group 1 will begin on the driving track with our ADI approved driving instructors. Each student will spend at least 20 mins behind the wheel. This is what the students love! In our safe, controlled campus designed with all the features of a public road, they will get a real feel for what to expect on the road and controls of the car. 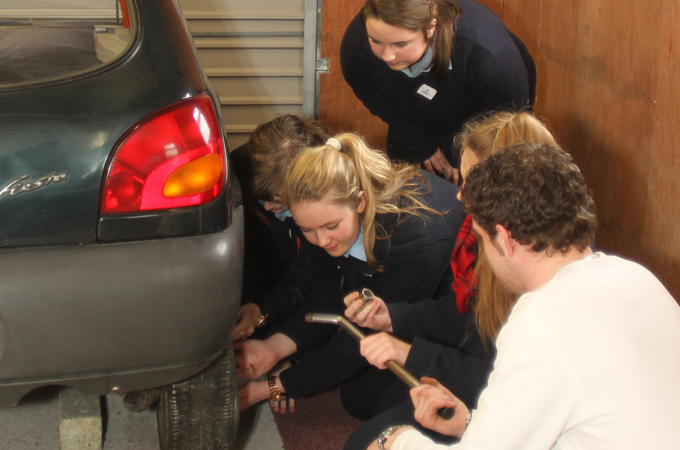 Here the students will learn the essential safety checks of a vehicle that are examined in the driving test. These checks are also a ‘need to know’ when owning your own vehicle. 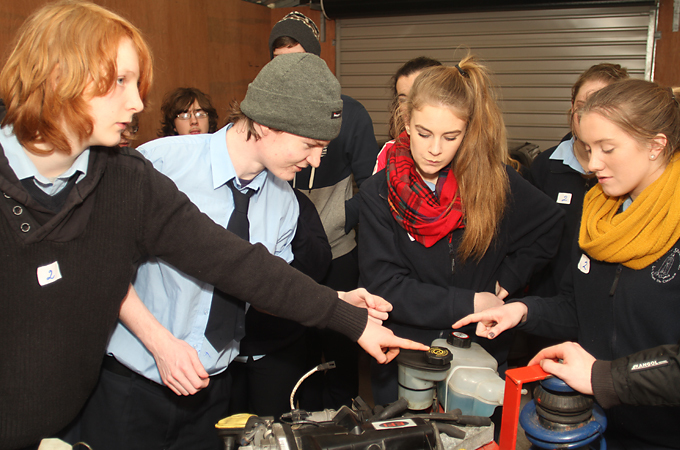 The students will get a basic introduction into the working mechanism of an engine. 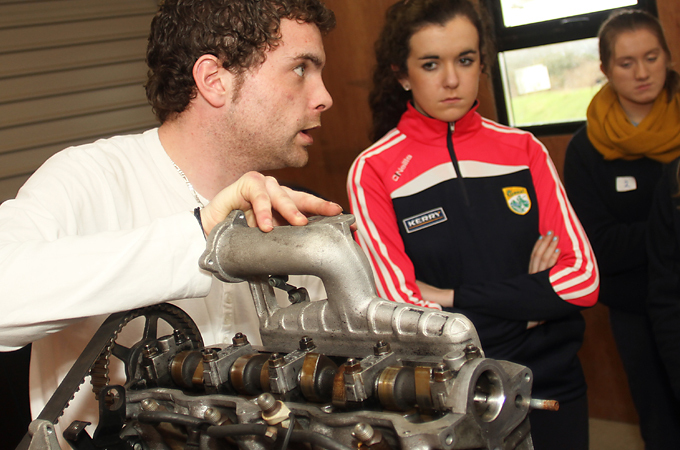 They will also receive in-depth tuition on how the clutch works, which will tie in with their driving skills. Never fear of being stuck on the side of the road with that dreaded puncture. The students will receive a step by step outline on how to change a wheel. Then they will be put to the test by demonstrating the skill they have learnt. Test your reflexes! With our unique brake reactor test, the students will learn about hazzards, how to react and breaking distance times. Groups of three students will undertake the theory test. It will give them a great insight into what to expect for the real theory test. A bit of fun! …but will also highlight the severe dangers of driving under the influence of alcohol or drugs.